The "Networks and Systems" department gathers LIP6 research activities related to networks, systems, and distributed systems. We analyze and design solutions for constructing and managing networks, systems, and distributed systems of the future. Those themes are represented by five complementary teams: NPA and Phare focus on networks, REGAL and Whisper dedicate their research activity to Systems, while Almasty's focal point is communication security and cryptography. 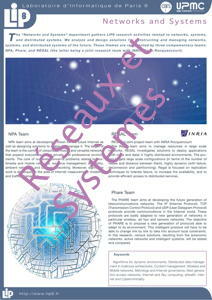 REGAL and Whisper teams are joint with Inria Paris. Algorithms for dynamic environments, Distributed data management in multicore achitectures, Content management, Wireless and Mobile networks, Metrology and Internet governance, Next generation access networks, Internet and Sky computing, eHealth, Internet and Cybercriminality, Cloud, Infrastructure Software, Cryptology, Communication Security.